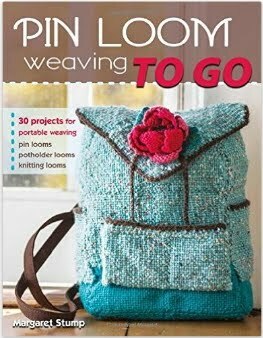 I have been on pins and needles, counting down the days until the Pin Loom Weaving publication date and waiting for the return of the items that will appear in the book. Many of the items are now back and I have started taking pictures to share, you can see some below. However, the publication date has been moved back a month, it is now June 1st, 2014. AAAAAUGH! I know that in the larger scheme of things it won't make that much difference, but I am really looking forward to sharing the book with everyone. 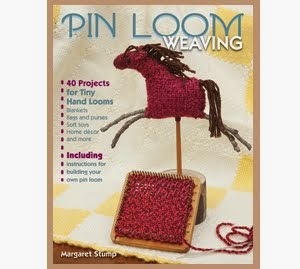 In the meantime, here is a beginning sample of the Pin Loom Weaving items. 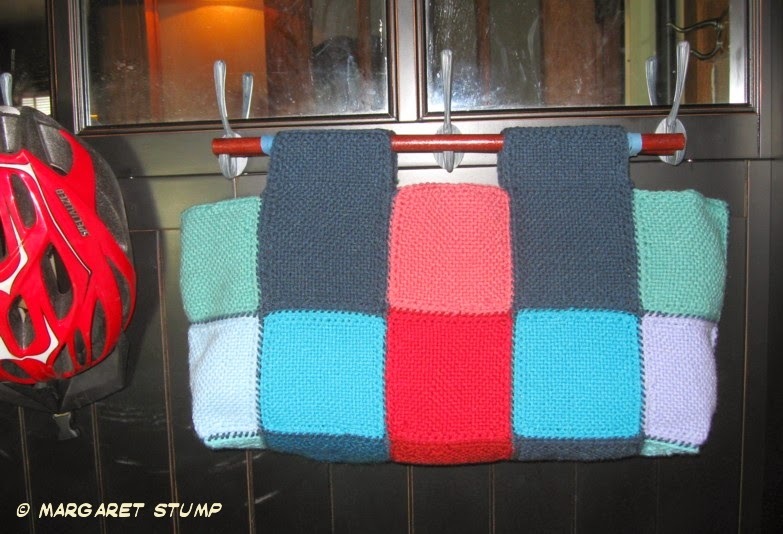 This is my most recent take on a yarn bag. I wanted to make something very simple, very usable. I like the idea that you can make them as deep as needed by adding on extra rounds of weavies. Dogs and cats... 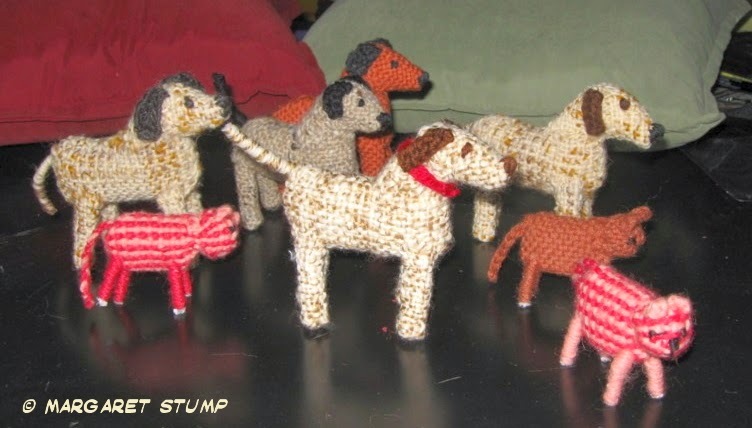 The dogs came first, the rest of the farm animal set (sheep, horse, cow, pig, cat, chicken, house and barn) followed. The design is variable enough so that you can create your dog favorites and put together your own dog show. 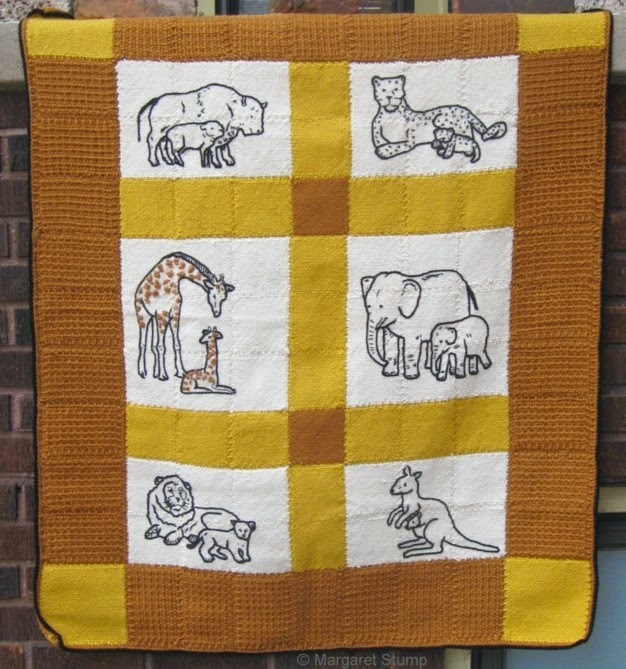 Animals Toddler Blanket... one of my favorites. It offers a number of features including soft, cuddly edges, a colorway and illustrations that will work for little boys or girls. The illustrations are applied with black crochet cotton and are reasonably easy to apply. The heavy lines are made using a crochet hook, fine details added with a tapestry needle. All the instructions and illustrations are available in the book and the book will be available June 1, 2014.